Yeah, but: A useful accessory for discontinued cameras. 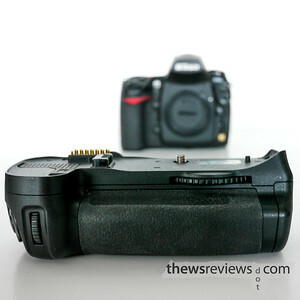 The Long Version: The MB-D10 battery grip is an interesting beast. It makes big cameras bigger, but somehow they become easier to hold as a result. The combination of the D10 grip with the D300 or D700 isn't as nice as the D3 family, or as small, but it does a pretty good job of pretending. The MB-D10 is unusual because it doesn't have the 'chimney' stack that extends into the camera body. Not only does the battery door not need to be taken off of the camera, the main battery stays in it. This means that the grip needs to be taken off of the camera to change the internal battery, but the thing is smart enough to pull power from the external pack first. The grip is exceptionally well built and designed. It's tailored to the camera, made of magnesium, and sealed against dust and rain. It has twin control wheels, AF-on button, and a second four-way controller for selecting AF points and other mundane tasks. In fact, I prefer its narrower joystick style to the wider nintendo-controller of the camera body. The MB-D10 magic happens in an unexpected way. It's called the multi-power pack for a very good reason, and putting in a higher-power battery makes a difference. 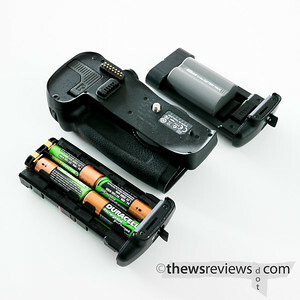 It can be the very expensive EN-EL4a of the D3 family, which requires the matching charger and battery chamber door, or it can be fed eight AA batteries via the tray that comes with the grip. Either option boosts the camera up to eight frames per second – not quite as impressive for the D300s, but a big deal for the D700. I've used the D10 with both the standard EN-EL3 and the AA batteries. When I'm using battery-eating live view and a tripod, the Nikon rechargeable are easy to swap out without even needing to turn the camera off. When I'm walking around with the camera I usually pick the AA option for the faster frame rate despite its heavier weight. It's nice to have the options. One little quirk that I've found with the AA batteries is that the power meter can be fooled. It drops straight to two bars from five, but pulling the batteries and returning them brings it back to full, where it stays for decreasing amounts of time as the batteries wear down. But with a little jiggling I can usually fill an 8GB card without switching to the internal battery, so I have no complaints, which is an unusual state to find myself in these days. A short, concise review that had just what I needed to know about this D700 grip.